Whistleblowing is defined as raising a concern about wrong doing and has gained prominence in the UK National Health Service (NHS) following the publication of the Francis Report (the report of the Mid-Staffordshire NHS Foundation Trust Public Inquiry) in 2013 (1, 2, 3). The report revealed that lack of diligence and a reluctance to speak out about poor practice amongst staff had contributed to increased patient morbidity and mortality (1, 2). In the wake of this report, a new framework was introduced by the NHS to help workers raise concerns regarding other staff and poor working practices in general (3). Nevertheless, it has been suggested that this new framework has not helped to increase whistleblowing or prevented staff who do raise concerns from being penalised (4, 5).1 Furthermore, it has been claimed that such implementations will encourage defensive medicine and reduce the willingness of staff to report concerns, despite the important role of whistleblowing in helping to prevent catastrophic events and improve care (2, 7). Further research is required to understand why healthcare professionals are reticent regarding whistleblowing (4). Moreover, while some research in the nursing and allied health community exists, this study is important as it adds to the limited evidence amongst medical students and staff in general (5, 8, 9, 10). It is also our contention, in addition to the above, that any programme of research into whistleblowing ought to consider perspectives from other geographical and cultural settings. This is because international perspectives can help to illuminate new issues, questions, and solutions relating to whistleblowing that can positively impact other healthcare systems (11). In conducting research into international perspectives on whistleblowing, we noted that there appeared to be limited research into the perceptions of whistleblowing among medical personnel in developing countries in the past decade2. In light of this, we used the opportunity afforded by a placement in the Department of Surgery, Edendale Hospital, Pietermaritzburg, South Africa to carry out research into the perceptions of whistleblowing amongst medical personnel. The aims of the research were broadly threefold: i) to elicit the views of medical personnel regarding whistleblowing, ii) to add to the current discussion and evidence base on whistleblowing in the South African healthcare system, and more generally, iii) to contribute to the current research base on whistleblowing in developing countries. The South African healthcare system is primarily a public/state healthcare system wherein a guide called the Uniform Patient Fee Schedule is used to bill patients for healthcare services (12). Alongside this, there is a smaller private sector in which care is generally regarded as being better than that in the public system although access is restricted by ability to pay. As such, private healthcare providers are invariably concentrated in the wealthier areas of the country. Additionally, within the state healthcare system, doctors work as a team within departments that report to unit heads and ultimately to the medical manager, who has a largely non-clinical role. This is in stark contrast to the private sector, where specialists or general practitioners practise independently from their peers. South Africa currently has a number of frameworks relating to disclosure and whistleblowing that are in turn underpinned by a set number of legal instruments such as the Protected Disclosures Act and the Labour Relations Act (11). Despite these regulatory frameworks, Martins argues, South Africans remain reluctant to engage in whistleblowing for reasons such as culture and perceived weaknesses in the law (11). Consequently, as noted previously, this study will add to the discussion on whistleblowing in South Africa, albeit from the healthcare perspective. For the purposes of this study, we used this working definition of whistleblowing by Martins: “Raising a concern about wrongdoing within organisations or through an independent structure associated with it” (11: p 5); which in turn was drawn from a definition used by the UK Committee on Standards in Public Life (11). Additionally, an “adverse event” was defined as an incident that caused (or had the potential to cause) harm to a patient. This was then expanded to encompass events that were illegal and/or were contrary to hospital guidelines. A literature search on PubMed, Scopus, and Discover was conducted to identify validated and standardised whistleblowing questionnaires that could be used in our study (Figure 1). No appropriate questionnaires were found. A questionnaire was therefore developed, using a variety of papers (1, 2), to be applicable internationally in gaining perspectives on whistleblowing (Table 1). “What would you do” questions This allows participants to describe their self-expectations rather than what they would actually do. Reporting suspected wrongdoing We wanted to gain responses from those who had observed wrongdoing. Multiple questions at the same time To increase coherence and reduce time consumption. Ethical approvals for the study were granted by the Department of Health for the province of Kwazulu-Natal Health Research Committee, South Africa (Ref no. 314/17, 16/08/2017), the Biomedical Research Ethics Committee, South Africa (Ref no. BE242/17, 23/08/17) and the University of Liverpool Faculty of Health & Life Sciences Committee on Research Ethics, United Kingdom (Ref no. 1735, 10/06/2017). The study was conducted in line with the principles of the Declaration of Helsinki. Written consent was obtained from participants on the front information sheet in the form of a tick so that they could not be identified. The questionnaire was handed in closed so the researcher did not know if it was filled in at this point and therefore could not pressure any participants. The research is entered in the Research Registry under research registration number – KZ 201708 001. A pilot questionnaire (Table 2) was used to develop the final questionnaire and consisted of 15 questions with check-box and free-text answer options. Check box answers were either “Yes, No, Unsure” or different factors that motivate whistle blowing. A pilot study highlighted the short and quick nature of our questionnaire. What circumstances would motivate you to report an adverse event and/or concerns about a colleague? What do you think is the most effective way to encourage healthcare professionals to report adverse events and/or report concerns about colleagues? What factors do you think prevent healthcare professionals from reporting adverse events? What factors do you think prevent healthcare professionals from reporting concerns about colleagues? The questionnaire was distributed to surgeons, physicians, and medical students on their surgical rotation at Edendale hospital. Non-medical staff and those who could not understand English were not included in the study. Non-probability sampling was used and a stratified population was drawn; this was disproportionate because a convenience sample method was utilised. Our aim was to reach as many clinicians as possible within Edendale Hospital. The number of participants was sufficient when there was no more variety in the responses participants gave (13)*. A majority of the participants was from the surgical department due to issues with access and resistance to implementation in different areas of the hospital. Surveys were distributed as hard copies mainly at staff meetings. Forms that were not returned or incorrectly completed were counted as non-respondents. Fifty-eight responses were collected between August 24, 2017 and August 31, 2017. Results were analysed through GraphPad Prism 7 using descriptive statistics; free-text answers were evaluated using thematic analysis (TK-O, AS). Thematic analysis was performed by giving the different free text answers codes that corresponded to certain themes and then adding up how often those themes were represented in the data. A second author, blinded to the first analysis, repeated this process in order to validate the thematic analysis. Both analyses yielded similar conclusions, and the outcomes were finalised after any disagreements were resolved by a more senior statistician. The response rate was 87% (58/67) from those individuals approached. Apart from one participant, the sample is restricted to personnel from the surgical specialisation or those associated with them (Table 3). There was a proportionate number of male participants (30) to female participants (27) in this study; one respondent did not mark gender. The total number of Surgeons and Anaesthetic doctors details the total number in their respective departments. Of the responses collected (n = 58), the majority (45/58; 77%) believed whistleblowing would benefit their institution. In addition, 7/58 (12%) thought it was not in their institution’s best interests and 6/58 11% were unsure. Although the majority of respondents understood the term whistleblowing (49/58; 83%), a significant minority did not; 6/58 (11%) were unsure, and 3/58 (6%) did not know. Participants were asked if there were clear systems for reporting adverse events and/or problems; 24/58 (43%) said “yes”, 22/58 (38%) were unsure, and 12/58 (18%) said “no”. Of the respondents, 46/58 (79%) reported no training in how to use these systems, whether they did or did not exist; 53/58 (91%) responded “yes” to there being a clear hierarchy in their unit; 43/58 (74%) agreed their unit delivered a high standard of care; and only 2/58 (3%) of participants said they did not (Figure 2). Clinicians were asked how able they felt to report an event in their unit; 31/58 (55%) felt they were able to report an adverse event, 12/58 (20%) said they could not, 13/58 (22%) were unsure, and 2/58 (3%) of participants did not respond to the question. 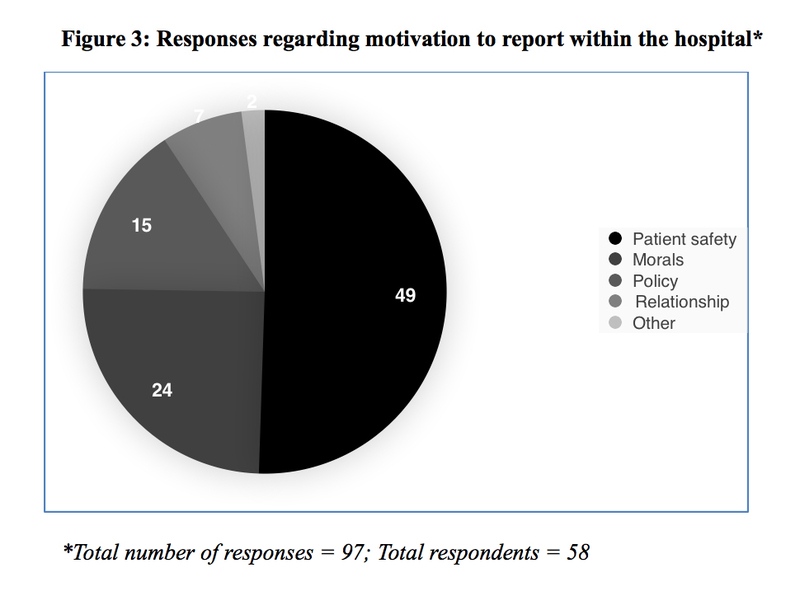 Of the 58 participants, 53 (91%) said patient safety was what motivated them to blow the whistle; this was followed by morality (20/58; 34%) and hospital policy (15/58; 26%). Although it was not explicitly mentioned in the questionnaire, participants were able to select more than one motivation; the most frequent was a single response (23/58; 39%). Therefore, of the 97 responses to this question, the most common motivation to report was patient safety (49/97; 51%) followed by morals (24/97; 25%; see Figure 3). Participants were also asked if they had ever been reluctant to report an event; 37 64% said they had never been reluctant, and 19 33% admitted some hesitancy. Of the 19/58 (33%) that had been reluctant in the past, 15 (79%) responded as to why this was the case. Hierarchy was cited by 5/15 (33%) of these, and racism or negative targeting by colleagues and employers caused hesitancy in 4/15 (27%); other responses concerned working conditions, relationships, and process. Participants were asked if it “is hard to acknowledge personal mistakes because of the consequences”; 19/58 (33%) agreed or strongly agreed. The reasons, if any, why they had not reported “an adverse event and/or concern about a colleague” or were reluctant to, were explored in free-text answers (reported in Table 4). Further to this, participants were asked what they believed to be the most effective way to increase the reporting of adverse events and/or concerns; these responses are also recorded in Table 4. The relative underrepresentation of groups other than that of surgeons must be considered when comparing response groups. Is there an appropriate system for reporting? 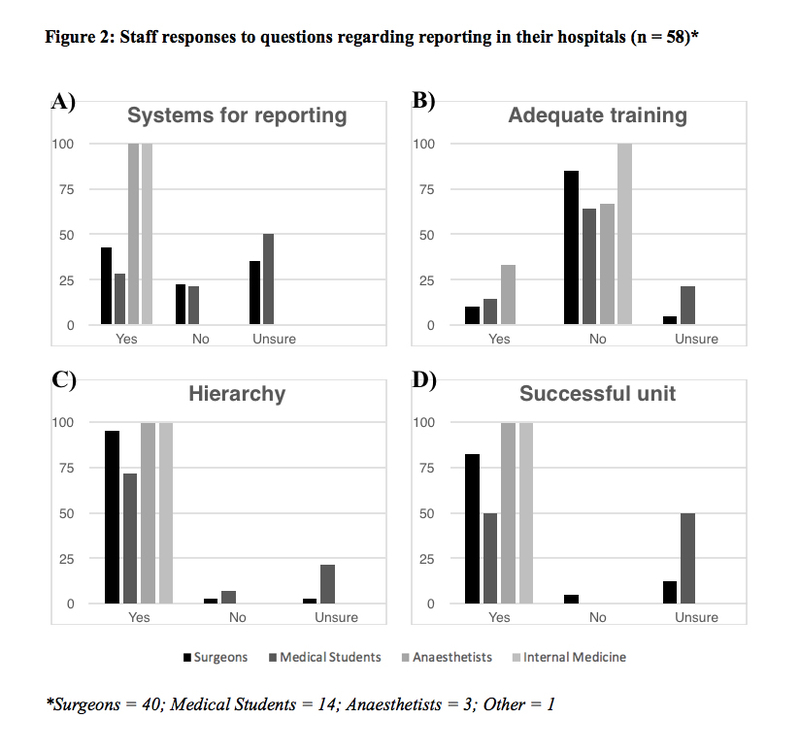 Both surgeons and medical students reported low agreement with the statement that there were adequate systems for reporting (41% and 21% respectively; Figure 2A). Is there adequate training within the hospital? The vast majority of surgeons (and small majority of medical students) disagree with the statement that adequate training is provided in their hospitals (82% and 57% respectively; Figure 2B). Is there a hierarchy in your hospital? The overwhelming response to this question suggests the majority of clinicians believe there is a hierarchy present in their hospital (Figure 2C). Does your unit deliver a high quality of patient care? The majority of clinicians believe there is high quality care being delivered; however, a larger proportion of medical students (56%) were unsure (Figure 2D). There is currently limited data on whistleblowing amongst doctors and medical students in the UK and developing countries. This study sought to add to a limited evidence base within this area of professional ethics. Although there was one physician and the main cohort in this study was surgical staff, nevertheless, advances in whistleblowing can be extrapolated to other healthcare professionals and other medical specialties because of similarities in clinical environment and consequences of whistleblowing (14). Current literature on whistleblowing in healthcare settings highlights the potential shortcomings of reporting systems that hinder the progress of reporting wrongdoing. Consequences of whistleblowing—such as character abuse, legal and financial penalties, and adverse impact on job security—highlight how crucial it is to protect whistle blowers (14). Our research supports this evidence; in free-text responses, 54% of participants said interpersonal factors (for example, relationships and hierarchy) hindered them from reporting events, and 14% said this was due to dangers involved. One participant said that her “interpersonal relationships that are threatened” would stop her from taking action, and another was worried about “the consequences it may have if the incorrect person was blamed”. An alarming 33% of people agree or strongly agreed that they failed to “acknowledge their personal mistakes because of the consequences”. This highlights a significant proportion of medical personnel that are potentially jeopardising patient safety because of legitimate concerns. In comparison to US and European studies, Finland has shown extremely high rates of appropriate whistleblowing due to the positive response that reports are met with; here 73% of whistleblowing reports are managed in a manner staff felt was positive (15). This is in clear contrast to India, for example, where there is limited formal support for whistle blowers (16). A significant minority (43%) of respondents said there was a clear reporting structure in their unit, but 53% highlighted a need for a reporting structure at Edendale. The discrepancy between responses emphasised the ambiguity and lack of an adequate reporting system in Edendale. It would have been useful to further question the 43% who said there was a system and the 21% who said they had received training in this system as there was no official system in existence at Edendale. There may have been some misunderstanding in answering the question or some genuine belief in the existence of a system, but this cannot be concluded from the responses. Interestingly, our study highlights personal and professional relationships as the leading factors contributing to failure to report events. Patient safety, the leading factor for 91% of respondents to report a concern, was challenged by interpersonal relationships in 24% of participants and seniority or hierarchy in 16% of participants. Participants said that “anonymous written reports”, “open fair communication that respects younger individuals”, and “actions being taken to correct what went wrong” would help encourage healthcare professionals to blow the whistle in light of these interpersonal and structural barriers. Furthermore, of those that were reluctant to report an event in the past, 33% revealed that this was also due to hierarchy in their department. This, however, is within the context of a relatively young population sample (mean 27.7 years) and may therefore disproportionately represent those who perceive hierarchy to be a barrier in reporting. Our research supports previous evidence that suggests medical professionals fear their superiors, which has been shown to be detrimental to both patient care and making positive change (17, 18). There are two main interventions that could address this issue. Firstly, staff should be educated on whistleblowing policies within their unit/hospital and further primed on how they can formally raise a concern. Secondly, barriers to reporting should be removed by improving IT reporting systems and appointing dedicated hospital guardians to offer possible methods by which the whistleblowing processes can be simplified. Additionally, the introduction of Schwartz Rounds might help to minimise hierarchical attitudes as well as foster better team working and the sharing of experiences3. Not previously highlighted in recent questionnaire-based studies was the term “whistleblowing” itself and its meaning. This study highlighted a significant number of students and staff (7%) who did not know what whistleblowing means. This was in conjunction with a further 10% of people who were unsure of its meaning. If improving patient care via whistleblowing is to be attained, a target rate of 100% understanding of exactly what whistleblowing means should be achieved amongst hospital employees. This also means that some staff may actually have blown or be blowing the whistle without knowing (10). Attempts to use other words with potentially less negative connotations have failed due to their ambiguity (10). The closed questions in the survey had Yes/No/Unsure answers, which limited the number of individual viewpoints that could be collected; however, this allowed for rapid responses. A consistent range of responses from “agree” to “disagree” (like items on the Likert scale) would have allowed for more descriptive feedback. Furthermore, it was not explicitly stated that multiple options could be selected for some questions; this may explain why most respondents only selected one. Changes in the scope of whistleblowing between questions (for example, in some places “adverse events and/or concerns” but “personal mistakes” in others) may have caused a variation in replies; however, each phrase is consistent with the aspects of whistleblowing described in the information sheet. The high response rate and percentage of the surgical department (95%) captured in this study allows our results to adequately represent this department in Edendale. The high number of participants in Edendale, a large government hospital, also allows our research to be more translatable to surgical departments in similar rural hospitals in South Africa. Nevertheless, the sample is unrepresentative of all hospital staff, and the generalisability of the results should be cautiously interpreted. Additionally, although this sample adequately represented staff in the surgical department, these were younger staff. It would have been useful to record the responses of department seniority. The complexity of obtaining ethical approval and the time constraints placed on the researchers meant that only one hospital could be surveyed. While the large size of the hospital, high response rate, and response saturation (see Note 2) allow for generalisation of results to the wider South African context, we acknowledge that caution is required when doing so. Research to include additional hospitals in South Africa would help to reinforce the results and strengthen generalisability. We are currently considering possible avenues to carry out an expanded version of our research in the future. This study can be a stepping stone to further investigation of whistleblowing internationally. Further investigation into whether education, reporting structures, and protection of staff are needed to improve whistleblowing in recently developed and developing countries is needed. Making whistleblowing an unambiguous and clearly stated duty might help alleviate barriers to reporting. In addition to this, the impact that relationships between medical personnel within the workplace have on patient safety should be further analysed and addressed, with a particular focus on developing nations hospitals in the context of previous studies. Our research-based questionnaire may also be used to inform future questionnaires and develop a standard whistleblowing questionnaire, which is currently non-existent. Our research highlights relationships within the healthcare setting, consequences of whistleblowing, and the (lack of proper) understanding of the term whistleblowing as barriers to medical professionals and medical students raising concerns about deleterious practices in the hospital. The potentially detrimental effects of working relationships on whistleblowing, and thus on patient safety, need to be actively considered by clinicians. Better education as to what whistleblowing is and how to approach reporting appears to be a crucial, if overlooked, factor as is the need to actively address fears, either perceived or actual, regarding whistleblowing. As clinicians, patient safety is our utmost priority; however, a lack of reporting systems and training contribute to reluctant whistleblowing. Further work should be done to elicit the views of a wider range of staff in developing and developed countries to advance the current evidence on barriers to whistleblowing and provide routes for intervention and improvement of reporting. Acknowledgments: We would like to thank all the participants of this study for taking part. We would also like to extend our gratitude to the Institute of Medical Ethics for helping sponsor the travel that made this research possible. Finally, we would like to thank our anonymous reviewers for their helpful feedback and advice on improving this paper. Contribution statement: TK-O designed this research study, collected and analysed the data, and was involved in writing and revising the final manuscript. AS and HB were involved in the data analysis and writing of the final manuscript. NA helped collect data and was involved in the final changes and revision of the manuscript. SO assisted in writing the revisions to the manuscript and approved the final manuscript. Funding: This study received funding from the Institute of Medical Ethics (UK). The award was a personal award to Mr. Ter-Er Kusu-Orkar. Conflicts of interest: The authors declare no possible conflicts of interest. 1 The recent case of Dr. Bawa-Garba in the UK has been cited as being illustrative of this problem (6). Dr. Bawa-Garba reflected on the death of a six- year-old boy under her care at Leicester Royal Infirmary. Following this, she was charged with manslaughter and struck off the General Medical Council medical register. Despite her recent re-appointment, this illustrates how a system of transparency and responsibility has not been adequately refined. 2 Example of search terms: Whistleblow AND Healthcare, Whistleblow Questionnaire, Healthcare AND perceptions, Whistle AND Doctors OR Nurses, Whistleblow AND Doctors, Whistleblow AND surgeons. 3 Schwartz Rounds were founded in the USA during the early 1990s by the Schwartz Round Centre for Compassionate Care (19). Named in remembrance of the Boston healthcare lawyer Ben Schwartz, Schwartz Rounds are a multidisciplinary forum in which a panel of clinical and sometimes non-clinical staff are invited to discuss the emotional and social aspects of healthcare. They are normally structured around the recounting of an experience around a particular title/theme, for example, “A patient I’ll never forget” (19, 20). It is important to note that Schwartz Rounds differ from traditional clinical “grand rounds” or “debriefs” as their focus is not on clinical aspects of care/practice or problem solving (19, 20). Bolsin S, Pal R, Wilmshurst P, Pena M. Whistleblowing and patient safety: the patient’s or the profession’s interests at stake? J R Soc Med. 2011 Jul;104(7):278-82. Mid Staffordshire NHS Foundation Trust Public Inquiry. Nurs Stand. 2010 Oct;25(7): 30. Kaptein M. From inaction to external whistleblowing: The influence of the ethical culture of organizations on employee responses to observed wrongdoing. J Bus Ethics. 2011 Feb;98(3):513-30. Cohen D. Back to blame: the Bawa-Garba case and the patient safety agenda. BMJ 2017 Nov 29;359:j5534. Mansbach A, Ziedenberg H, Bachner YG. Nursing students’ willingness to blow the whistle. Nurse Educ Today. 2013 Jan;33(1):69-72. Mansbach A, Melzer I, Bachner YG. Blowing the whistle to protect a patient: a comparison between physiotherapy students and physiotherapists, Physiotherapy. 2012 Dec;98(4):307-12. Hodges LE, Tak HJ, Curlin FA, Yoon JD. Whistle-blowing in medical school: A national survey on peer accountability and professional misconduct in medical students. Acad Psychiatry. 2016;40(3):530-3. Saunders B, Sim J, Kingstone T, Baker S, Waterfield J, Bartlam B, Burroughs H, Jinks C. Saturation in qualitative research: exploring its conceptualization and operationalization. Qual Quant. 2018 Jul;52(4):1873-1907. Chatterjee P. Whistleblowing in India: what protections can doctors who raise concerns expect? BMJ. 2015 Feb 4;350:h763. Mansbach A, Kushnir T, Ziedenberg H, Bachner YG. Reporting misconduct of a coworker to protect a patient: a comparison between experienced nurses and nursing students. ScientificWorldJournal. 2014;2014:413926. Loyens K, Maesschalck J. Whistleblowing and power. In: Brown A J, Lewis D, Moberly R, Vandekerckhove W, editors. International handbook on whistleblowing research. Northampton: Edward Elgar Publishing; 2014. p. 154-74.